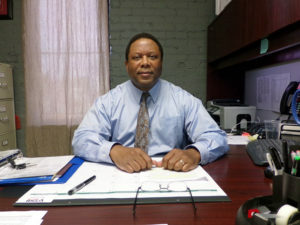 After a lengthy selection process, the Town of Wilson’s Mills has named Adrian Williams as their new Chief of Police. Williams began work last week overseeing the department’s 5 full-time and 10 part-time officers who are charged with protecting the town’s 2,700 residents. Williams, 52, grew up in the Fayetteville area, graduated from Douglas Byrd High School and then attended NC State University. He received a Bachelor’s Degree in Political Science with a minor in Criminal Justice. Later he received his masters degree from NC State in Liberal Studies. There is no doubt Chief Williams is a big Wolfpack fan. He also is certified as a NC Public Manager. Williams most recently worked with the NC State Bureau of Investigation for 17 years in their Fayetteville office before retiring earlier this year. He then applied for the job as Wilson’s Mills Police Chief. Williams said law enforcement is a difficult job but he and his officers are committed to protecting and serving the residents. He says he looks forward to meeting the citizens and business owners. Chief Williams says he plans to fill a few vacancies on the police force by hiring very qualified patrol officers. He also plans to examine budget and resource needs before making any long range goals. Williams is married to his wife of 28 years, Lenora, a nurse at Fort Bragg. They have two adult children, Adam, 27, and Meredith, 24. He is also expecting his third grandchild very soon. While not wearing the badge, Chief Williams, who doesn’t want anyone to forget he is a big Wolfpack fan (yes we mentioned that twice), enjoys being outdoors, hiking, swimming, canoeing, kayaking, water sports, and racket ball. He is currently in the process of relocating from Fayetteville to the local area. He will receive his ceremonial Oath of Office at the September 17th meeting of the Wilson’s Mills Town Council.